Then there's Ensaladang Hipon at Suha in Mango Salsa. You've got to see not only the cooked dish but also the process of cooking it goes through. Fabio doffs his hat off to this extremely gifted executive chef who not only loves food, he passionately adores cooking. 1 For Mango salsa combine all ingredients into the blender until creamy. Season to taste. 2 Remove the vein of shrimp by using bamboo sticks, then skewer each piece without head. 3 Have ready water and white wine into the pot with lemon slice and leeks, celery leaves. Boil for 3 minutes. Remove from boiling water and set aside. Keep cool. 4 Take off the shell but leave the tail. Cut into butterfly from the stomach sides of the shrimp, then place it on clean cloth or absorbent kitchen paper towel and press it to become flat and set aside. 5 Chop peeled shrimps or put them in food processor. Place in bowl and combine pickle relish, pimientos, celery, walnut, spring onion, tomato, mayonnaise, hot sauce, salt and pepper. Set aside. 6 Twist thin, long slices of foot-long bread inside the ring mould, then bake in low heat for 30 minutes or until toasted. 7 Rinse and dry the lettuce and place inside the toasted footlong bread. Arrange on plate with bouquet of lettuce. 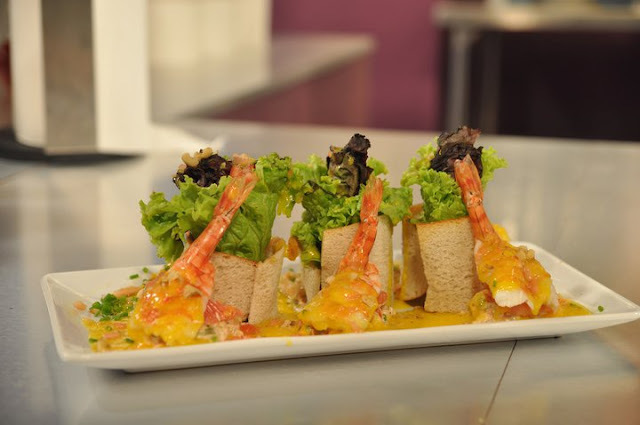 8 Place the shrimp mixture on plate, over the top with pomelo wedges and butterfly prawns. 9 Spoon or drizzle with mango salsa before serving. Sprinkle with walnuts and spring onion.